Larry Miller is a Life Member of the PGA of America and a former PGA Tour Player. An author of three other books on golf and performance, he has taught golf and given talks and clinics all over the U.S. and abroad. Larry lives in Mandeville, Louisiana, a suburb of New Orleans. Each sport has its heroes, those unique talents whose exploits become modern mythology to those who follow in their footsteps. Even as their records fall, these special athletes retain their status as legends. Their names transcend sport, as their skills and successes find their place in history. 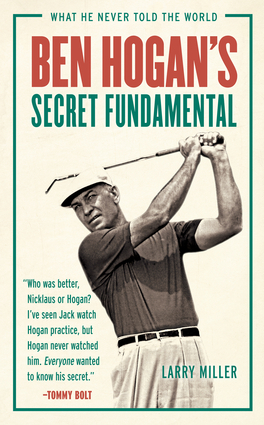 Nobody represents this rarified iconic status more than golfer Ben Hogan. Hogan is widely considered the greatest ball striker in the history of the game. His swing is golf’s equivalent of Wayne Gretzky’s slap shot, Muhammed Ali’s knockout punch, or Sandy Koufax’s fastball, unlike anything before it and impossible to surpass. With Miller’s great new title and the revelations within, golfers everywhere can come that much closer to playing the game the way Hogan did.